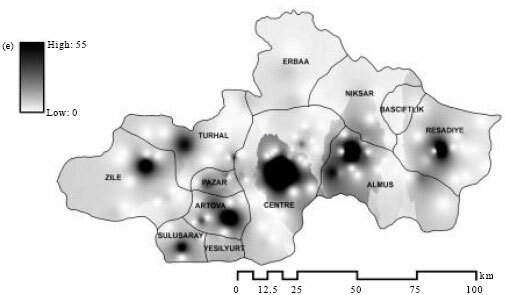 In this study, we investigated the spatial distribution of CCHF incidences of Tokat Province within the frame of Geographic Information Systems (GIS). For this purpose, we evaluated the public health data collected between 2003 and 2006. Frequency data that belongs to 133 settlements was joined to the referenced point database of Turkey in GIS and interpolated to raster maps by employing Kriking method with Spherical variogram model. Produced raster maps of each year and combination of all years were interpreted visually. Relationships between incidence and other available variables (population, elevation, cattle number, sheep and goat number) were investigated by employing bi-variety correlation analysis (Pearson coefficients). According to the results, CCHF events in Tokat increased from 50 to 100 within the 4 years and showed the tendency to spread in certain geographic locations of the province. CCHF incidence and elevation showed significant (positive) correlation (0.687) at 0.05 level under an altitude threshold (1340 m). Hakan Mete Dogan, Ilhan Cetin and Mucahit Egri, 2009. Investigating Geographical Distribution of Crimean-Congo Hemorrhagic Fever in Tokat County of Turkey. Journal of Biological Sciences, 9: 217-223. Crimean-Congo Hemorrhagic Fever (CCHF) is an acute viral disease in humans. It is caused by CCHF virus that is transmitted to humans either by Hyalomma ticks or by direct contact with the blood of infected humans or domestic animals. Like other tick-borne zoonotic agents, CCHF virus mostly spreads in nature unnoticed in an enzootic tick-vertebrate-tick cycle (Whitehouse, 2004). CCHF virus has been isolated from wild vertebrates and numerous domestic animals such as; cattle and goats (Causey et al., 1970), hedgehogs (Causey et al., 1970), sheep (Yen et al., 1985), domestic dogs (Shepherd et al., 1987a, b), horses, donkeys and pigs (Watts et al., 1989). Hyalomma ticks are widespread in North Africa, Southern Europe, Middle East, Central Asia and China (Burt et al., 1998). The known distribution of CCHF virus covers the greatest geographic range of any tick-borne virus and there are reports of viral isolation and/or disease from more than 30 countries in Africa, Asia, Southeast Europe and the Middle East (Hoogstraal, 1979). Evidences of CCHF in France, Portugal, Egypt and India are based on limited serologic observations. However, outbreaks are sometimes possible after several decades of serologic evidences such as the recent outbreak in the middle Black Sea region of Turkey (Karti et al., 2004; Bakir et al., 2005). There are two different genetic lineages of CCHF virus are circulating in Turkey. These closely resemble virus lineages found in Kosovo and Southwestern Russia and are clearly distinct from those associated with a recent CCHF outbreak in neighboring Iran in 2002 (Mardani et al., 2003). Over the past decade, rapid changes in technology and information management have started a new era in public health practice. One of the most exciting technological developments is Geographic Information Systems (GIS) that has the capacity to bring community health assessment and improvement down to the neighborhood level (Melnick, 2001; Cromley and McLafferty, 2002). Moreover, the availability of spatial data in digital format has greatly increased in recent years. Analysis of such data in Geographic Information Systems (GIS) has led to increasing applications in studies of the population dynamics of various arthropod vectors in relation to a range of ecological factors and disease prediction (Hay, 2000). GIS maps displaying reliable epidemiological data can play an important role in assessing the magnitude of the problem and defining priority areas for control. Recent applications of these spatial analytic techniques to vector borne diseases have demonstrated the emerging utility of this technique (Maupin et al., 1991; Reisen et al., 1997). CCHF events among people in Tokat Province of Turkey have increased since 2001. This situation has attracted attention of many public and research organizations studying in the region. Delineating spatial distribution of CCHF events is important and necessary to investigate the relationships between incidences and other related variables. To fulfill these requirements, present study has aimed to two important objectives that are mapping spatial distribution of CCHF and researching relationships between CCHF and other available (population, elevation and animal number) variables in GIS. Resulting maps have the potential to help the researchers and decision makers who work in the region and can be helpful for the studies especially devoted to environmental and ecological modeling of CCHF. Tokat Province positioned in the transition zone between Inner Anatolia and Middle Black Sea regions of Turkey (Fig. 1a). The province covers 9912 km2 area and has 12 administrative districts namely; Almus, Artova, Başçiftlik, Centre, Erbaa, Niksar, Pazar, Reşadiye, Sulusaray, Turhal, Yeşilyurt and Zile (Fig. 1b). Semi-arid Upper Mediterranean Bioclimatic characteristics with cold winters rule in the region (Akman, 2007). Physical geography of the province shows mountainous characters with the changing elevation between 85 and 2416 m (Fig. 1b). Yeşilİrmak River and Kelkit Stream are the main drainages in the region. Agriculture and stockbreeding are basic economical activities in the lower parts of the province. According to General Directorate of Rural Services (KHGM) soil database; soils characteristics of the province can be summarized as; Brown Forest (60.63%), Noncalcerous Brown Forest (13.62%), Chestnut (7.42%), Alluvial (5.76%), Reddish Chestnut (4.38%), unclassified (settlement-rock, 3.42%), Colluvial (2.92%), Brown (0.94%), Grey Brown Podsolic (0.78%), Reddish Brown (0.12%) and Hydromorphic (0.02%) (KHGM, 2002). In geological point of view, Tokat Complex can be summarized as relatively rare serpentinite and radiolarian chert in blocks of variable size and strongly deformed tectono-sedimentary mixture of low-grade metamorphic rocks with abundant re-crystallized limestone (Bozkurt et al., 1997). In this study, we utilized the CCHF data provided from Communicable Diseases Division of Health Directorate in Tokat Province. Basically, this data covers the four years records between 2003 and 2006 and contains the information about names, ages, addresses of the patients. We firstly processed this dataset and calculated the frequency of CCHF events of the settlements in each year. Processing the data, we separately prepared five database (dbf) files for each year and combination of all years in Microsoft Excel software (professional edition). Geographic references of the settlements in dbf files were determined by utilizing the settlement (point) database of Turkey. All geo-referenced dbf files were converted to shape files separately in ARC/GIS software (version 9.1). Then, we interpolated the produced shp files to raster maps (30x30 m resolution) by applying Kriking method with Spherical variogram model in ARC/GIS. Produced raster maps were interpreted considering spatio-temporal change and geographical locations. Logarithms of incidence (INCLOG), elevation (ELEVLOG), sheep and goat number (SGLOG), cattle number (CATLOG) and population (POPLOG) values were calculated to get normal distributions. All these logarithmic variables were arranged at administrative district level and bivariate correlation analysis (Pearson coefficients) was applied in SPSS software (version 11). Finally, we produced an INCLOG map in ARCGIS by joining INCLOG values to administrative district map database. CCHF events were determined in 133 settlements within the total 718 settlement units of Tokat Province (Fig. 2a). During this four-year period, 14 deaths, caused by CCHF, were recorded in 12 settlements (Fig. 2b). The total frequency of the events between the years 2003 and 2006 was observed as 336 (Table 1). The lowest (50) and the highest (100) frequencies were detected in the years 2003 and 2006, respectively. Frequency values increased continuously from 2003 to 2006 and reached to highest level (100) in 2006. Considering total frequencies, Centre (108), Almus (64), Reşadiye (35), Artova (32), Zile (29) and Turhal (23) administrative districts have the most striking results comparing to others. CCHF frequency values changed between 4 and 17 in the other administrative districts, while no incidence was determined in Başçiftlik. The produced raster maps played important role to understand the geographical distribution of the CCHF events in Tokat Province (Fig. 3). First of all, these maps visualized both spatio-temporal change year to year (Fig. 3a-e) and combination of the four year results (Fig. 3e). Evaluating the years separately, geographical distribution of CCHF incidences showed similar inclination. On the other hand, the raster map of 2004 showed some difference comparing to others (Fig. 3b), because incidence frequency of some settlement units increased to the highest level (27) of four year period. Higher frequency values were found in Centre, Artova and Almus District in 2003 (Fig. 3a), respectively. Moreover, Centre, Reşadiye and Almus were determined as the leading districts where the most events were encountered in 2004 (Fig. 3b). The most events occurred in Centre, Almus, Turhal and Pazar District in 2005 (Fig. 3c). Finally, Centre, Artova, Pazar, Sulusaray and Turhal District attracted attention with higher CCHF events in 2006 (Fig. 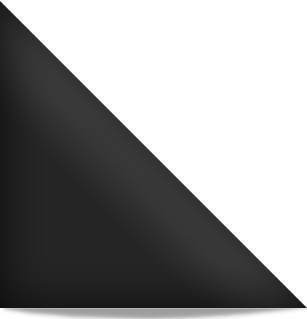 3d). The combination map, produced by aggregating the four year frequency results, made us possible to evaluate all years results as a whole. According to the combination map (Fig. 3e); the most CCHF events occurred in Centre and this was followed by Almus, Reşadiye, Artova, Zile, Sulusaray, Turhal and Pazar, respectively. The Northern districts (Erbaa, Niksar and Başçiftlik) were found as the places where CCHF events rarely occurred. INCLOG values of administrative districts also verified this general distribution (Fig. 4, Table 2). INCLOG values changed between 1.29 and -0.26 and Artova (1.29), Sulusaray (1.18) and Almus (1.17) districts have higher INCLOG and Elevation (ELEV) values comparing to others (Table 2). Correlation analysis results clarified relationships between INCLOG and the focused variables (Table 3) and INCLOG and ELEVLOG (0.687) showed significant (positive) correlation at 0.05 level. Basically, low CCHF events occurred in Niksar and Erbaa plains, while higher rates were determined in Kazova plain. Although all these plains have similar geographic characteristics, the difference could be related to different agricultural practices in those places. It is thought that the low CCHF events in Niksar and Erbaa plains might be related to excessive pesticide usage because of incentive agricultural applications. Comparing to Niksar and Erbaa plains, pesticide usage is low in Kazova plain. This case can be investigated in a quantitative way if a detailed database related to pesticide usage will be implemented. Database establishment about this subject are still continuing. We observed that the positive correlation (0.687) between INCLOG and ELEVLOG variables changed sharply after a certain altitude. Başçiftlik, for instance, is the district which has the highest elevation value (1340 m) but no CCHF events. Moreover, there is almost no pesticide usage in this area. This situation suggested that there might be an altitude threshold (1340 m) where Hyalomma ticks can not find an opportunity to establish in it. Under this threshold, CCHF events rise with the increasing elevation values, because moderate agricultural activities with less pesticide applications substitute the incentive agricultural activities in higher elevations. When the habitat characteristics of Hyalomma ticks will be researched and modeled, all these anthropogenic factors should be taken into consideration in a detailed manner. Lowest incidence frequency in the northern districts (Erbaa, Niksar and Başçiftlik) is another important point that took our attention. One of the reasons of this situation could be related to the Köse Mountains that established a natural barrier between these districts and highly infected districts (Fig. 1). On the contrary, higher incidence frequency in the centralized districts may be related to higher animal movements because of vigorous economical activities. After deep examination of all these factors, the relationship among all these factors could be modeled. Present studies about modeling have been continuing. Finally, the frequency values of 2003 change between 0 and 17 in Table 1, while they alter between 0 and 6 in Fig. 3a. At a first glance, it may be thought that there is discordance between Table 1 and Fig. 3. This is fairly normal because the values in Table 1 and Fig. 3 represent disparate facts. The values in Table 1 corresponded to the total frequency values of administrative districts. On the other hand, the values in Fig. 3 represented the frequency values of different settlement units in a single administrative district. For instance, the highest frequency value (17) of Almus in 2003 (Table 3) belongs to different settlement units of Almus District and it represented the total incidence number in the whole district area. This situation emphasized the importance of raster maps that made us possible to produce robust interpretations. Using geography, GIS linked and integrated simple CCHF frequency data to settlement database of Tokat Province rapidly and accurately. The process of linking these data sets encouraged data-sharing partnership between local health departments other relevant establishments such as governorship, research institutions and university. Producing raster maps, GIS gave us easily understandable visual pictures of CCHF events in the study area. GIS presented these pictures in attention capturing way that program managers, policy makers, community partners and others can easily evaluate. Moreover, GIS allowed us to analyze and display CCHF data at the province level. We found this level is particularly useful to understand the nature of geographic distributions of CCHF events within the borders of Tokat Province. In this way, an initiative raster database was created so that researchers in the region can access and use. This kind of database is extremely important for the successful public health management. This study put forwarded that how effective maps related to public health could be produced by using the interpolation techniques which is one of the simplest functions of GIS. Determination of geographic distribution of frequency values of CCHF events is extremely important to develop models and to determine habitat characteristics of acarids that are effective on CCHF spreading. Akman, Y., 2007. Bio-geography. 1st Edn., Palme Press, Ankara, ISBN: 975-8982-49-4, pp: 472. Bakir, M., M. Ugurlu, B. Dokuzoguz, H. Bodur, M.A. Tasyaran and H. Vahaboglu, 2005. Crimean-congo haemorrhagic fever outbreak in Middle Anatolia: A multicentre study of clinical features and outcome measures. J. Med. Microbiol., 54: 385-389. Bozkurt, E., B.K. Holdsworth and A. Kocyigit, 1997. Implications of jurassic chert identified in the tokat complex, Northern Turkey. Geol. Maga., 134: 91-97. Burt, F.J., P.A. Leman, J.F. Smith and R. Swanepoel, 1998. The use of a reverse transcription-polymerase chain reaction for the detection of viral nucleic acid in the diagnosis of Crimean Congo haemorrhagic fever. J. Virol. Methods, 70: 129-137. Causey, O.R., G.E. Kemp, M.H. Madbouly and T.S. David-West, 1970. Congo virus from domestic livestock, African hedgehogs and arthropods in Nigeria. Am. J. Trop. Med. Hyg., 19: 846-850. Cromley, E.K. and S.L. McLafferty, 2002. GIS and Public Health. 1st Edn., The Guilford Press, New York. Hay, S.I., 2000. An overview of remote sensing and geodesy for epidemiology and public health applications. Adv. Parasitol., 47: 2-27. Hoogstraal, H., 1979. The epidemiology of tick-borne crimean-congo hemorrhagic fever in Asia, Europe and Africa. J. Med. Entomol., 15: 307-417. KHGM., 2002. National soil database of Turkey. General Directorate of Rural Services of the Ministry of Agriculture and Rural Affairs, Ankara. http://www.khgm.gov.tr. Karti, S., S. Odabasi, Z. Korten, V. Yilmaz and M. Sonmez et al., 2004. Crimean-Congo hemorrhagic fever in Turkey. Emerg. Infect. Dis., 10: 1379-1384. Mardani, M., M.K. Jahromi, K.H. Naieni and M. Zeinali, 2003. The efficacy of oral ribavirin in the treatment of Crimean-Congo hemorrhagic fever in Iran. Clin. Infect. Dis., 36: 1613-1618. Maupin, G.O., D. Fish, J. Zultowski, E.G. Campos and J. Piesman, 1991. Landscape ecology of lyme disease in a residential area of Westchester County, New York. Am. J. Epidemiol., 133: 1105-1113. Melnick, A.L., 2001. Introduction to Geographic Information Systems in Public Health. Aspen Publication, Maryland. Reisen, W.K., H.D. Lothrop, S.B. Presser, J.L. Hardy and E.W. Gordon, 1997. Landscape ecology of arboviruses in Southeastern California: Temporal and spatial patterns of enzootic activity in Imperial Valley, 1991-1994. J. Med. Entomol., 34: 179-188. Shepherd, A.J., R. Swanepoel, P.A. Leman and S.P. Shepherd, 1987. Field and laboratory investigation of Crimean-Congo hemorrhagic fever virus (Nairovirus, family Bunyaviridae) infection in birds. Trans. R. Soc. Trop. Med. Hyg., 81: 1004-1007. Shepherd, A.J., R. Swanepoel, S.P. Shepherd, G.M. McGillivray and L.A. Searle, 1987. Antibody to Crimean-Congo hemorrhagic fever virus in wild mammals from Southern Africa. Am. J. Trop. Med. Hyg., 36: 133-142. Watts, D.M., M.A. Ussery, D. Nash and C.J. Peters, 1989. Inhibition of Crimean-Congo hemorrhagic fever viral infectivity yields in vitro by ribavirin. Am. J. Trop. Med. Hyg., 41: 581-585. Whitehouse, C.A., 2004. Crimean-congo hemorrhagic fever. Antiviral Res., 64: 145-160. Yen, Y.C., L.X. Kong, L. Lee, Y.Q. Zhang, F. Li, B.J. Cai and S.Y. Gao, 1985. 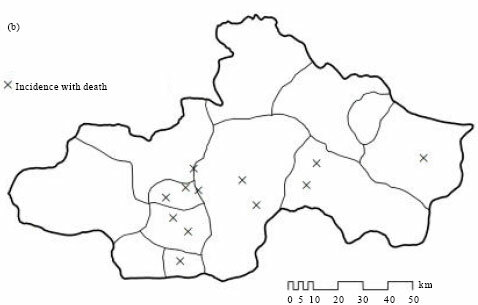 Characteristics of Crimean-Congo hemorrhagic fever virus (Xinjiang strain) in China. Am. J. Trop. Med. Hyg., 34: 1179-1182.